Boquete is Panama’s most famous growing region. The surroundings of Chiriquí Highlands and Barú Volcano are contributing factors to the small towns reputation, but it is best known for its premium quality coffee. Some claim it is the finest in the world, but this is down to personal preference. There are many reasons why this small region produces such exceptional beans, with its climate and growing conditions having the main responsibility for their high quality. Panama flavour profiles are often described as clean tasting, well balanced and delicate with a touch of subtle sweetness. La Gloria Estate doesn’t compromise on quality when it comes to its growing conditions and rituals, which is why the beans are so consistently delicious. Their access to natural spring water and plenty of rain fall are big contributing factors to the delicious taste of these Panama beans. The estate benefits from continuous mist and cooler temperatures, which slows down the maturity process of the coffee cherries. This amplifies the flavours, and some believe this gives the characteristics of a high altitude. Strictly hard beans (SHB), also known as strictly high grown (SHG), are beans that are grown at an elevation of at least 1200m. The biggest benefit of SHB is that the high elevations slow down the development of the coffee cherries. This allows the bean to receive a higher concentration of nutrients, which results in more flavour and favourable characteristics. These beans are much harder and denser than normal beans. They are usually more sought after as the desirable flavours and premium quality is consistent. There are many ways to brew this Panama coffee, and we recommend trying a few different methods to see which gives you the best results. A cafetiere is ideal for bringing out honeyed sweetness and enhancing subtle sweet flavours. This method would be great for bringing out the chocolatey richness and vanilla flavour. If you’re looking for stronger and darker flavours, you may prefer using a stove top espresso maker. Buy beans and grind them at home. As soon as beans have been ground, they slowly begin to lose flavour. Although it takes weeks before they go stale, grinding at home is the best way to get the freshest flavour. Pay attention to grind size. Depending on what brewing method you use will depend on the grind size you should opt for. Read our grind size article to see which is best for a cafetiere. Keep your equipment clean. Old grounds in your brewing device will give a bitter taste. The rich flavours of chocolate and nut in these beans are perfectly balanced by the delicate flavours of vanilla. To get the most out of this delicious flavour profile, we roast these Panama beans to a medium level. We always hand roast in small batches to not only ensure an even roast, but so we can accurately monitor the progress of the beans. This allows us to create premium and consistent results. 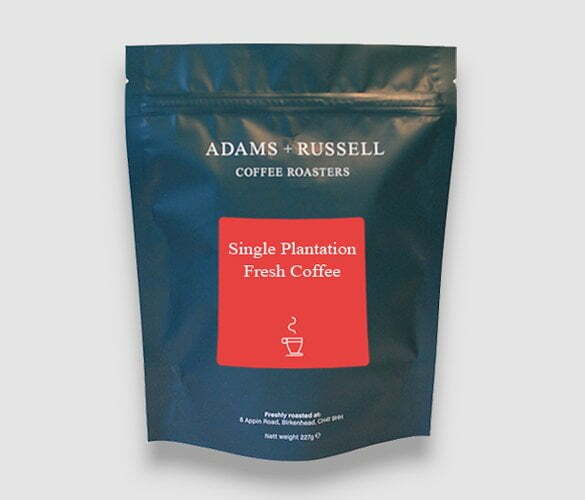 To get a behind the scenes insight into our roasting process, head over to @adamsandrussell on Instagram. A very pleasant…moorish coffee. One of our favourites to enjoy anytime….. and we do! A beautifully rounded, softly floral (to my taste!) and incredibly flavoursome cup. More of a day-time indulgence due to its comparative lightness. A new favourite one for me!